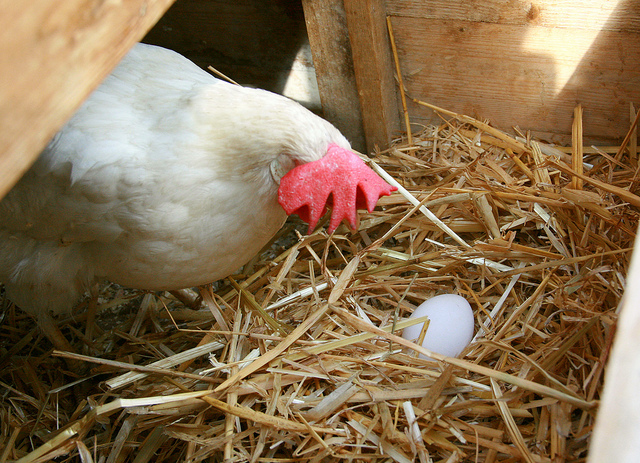 5 tips for getting hens to lay in nest boxes. Do your hens lay their eggs everywhere but the nest boxes? Here are a few tips to encourage them to lay eggs in the nest boxes. • Do you have enough nest boxes: 1 box for every 4 to 5 hens is the minimum for hens to feel comfortable laying in them. • Are your nests appealing: Make sure the nests are in a dark, quiet place in the coop. Boxes should be a few inches off the floor. • Train them with a “nest egg”: You can purchase a fake ceramic or wood egg from a farm supply store or online. You can even use a golf ball if needed. When your chicks get ready to lay, by placing the “nest egg” in the nests, this gives them the idea that this is the place to lay. • Keep them confined until mid-morning: Most hens lay early in the morning, so by keeping them in the coop, this will maximize the chances that they’ll lay in the nest boxes instead of finding a place outside of the coop. • Make nests soft and comfy: If the wood shavings get depleted in the boxes, the hens tend to avoid them. Keep shavings or straw nice and fluffy to encourage laying in the boxes. Previous PostPreparing for winterNext PostA better understanding of the NPIP.